OK, I know that BMI is not the greatest form of measurement for weight loss and fitness success, but it is out there and screaming at us all the time. This makes it very hard to ignore. I don't tend to worship at the alter of the great BMI, but I do watch it. If you look at my weekly stats, I list both BMI and what the caliper says. I know that most people would trust the caliper over the BMI, but I am not sure how accurate I am with the caliper. Here is where I get to the first signs of normal. According to the BMI charts, when I started in January of 2007 I was obese with a BMI of 38.1. I celebrated when I finally became overweight at 29.9. I now am inching in on the normal range of 24.9 with a current BMI of 25.8. Monday morning when I was doing my stats I went to enter my weight on www.skinnyr.com for the chart that shows up at the bottom of my blog. I think their calculations are off a little bit, but was I ever excited when I saw that they had my BMI showing normal. You can see in the image to the right that it shows normal. Now, I know according to the official BMI I am not normal until 24.9, but for someone to think I am normal makes me very happy! Thanks Skinnyr! 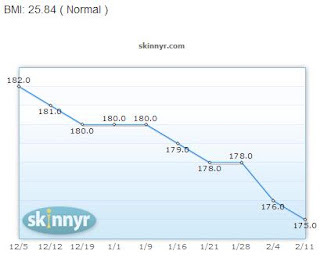 Why not embed your physicsdiet.com chart? You can do it with an image tag that specifies the start date, width, and height of the chart. Here's one from Jan 1. Line wraps are introduced by blogger, don't include them. Thanks Alex, I didn't know I could do that with Physicsdiet.